After fearing that the snow would sabotage things, a group of friends (Andy, Graham and Simon), all TomCon veterans rendezvoused at my house in Wetherby from places as far afield as Sheffield and Settle. Our objective was simple - to play some of the many boardgames that had built up unplayed at my house. We called the event "DomCon", a resurrected title from the days that I ran my Stormbringer RPG campaign.We were accompanied through the afternoon by my 6 year old, Nathan, who joined in some games, bailed out of others, and complicated one even more than the rules did. I'd shared links to the excellent Dice Tower reviews of the games we planned to play the night before. I recommend these if you're coming old to a game as they give a feel for the mechanics. We started with Escape: The Curse of the Temple, recommended to me as a fun cooperative game suitable for kids by Steve Hatherley around the time I tried out Forbidden Island for the first time. The premise is simple; think of the sequence at the start of Raiders of the Lost Ark when Indiana Jones has to escape the temple/tomb where he steals the golden idol. The game has square tiles of the temple rooms which you explore by rolling a set of five dice and getting the right icons come up. If you roll a black skull, that dice is frozen, but two black skulls can be released by throwing one of their golden counterparts, which come up just as often. You need to find the way out,and along the way as many jewels as possible. The jewels are important, as they make it easier to carry out the final escape as the number unfound relates directly to the number of icons that you have to roll to escape. There are three catches. The first is that you will need more than one player working together to release some of the jewels as they need more icons than you have dice. The second is that the whole game is played real time, against a soundtrack that lasts just over ten minutes. This results in a frenetically paced set of dice rolls, and a good deal of self-pressurisation. The final catch is that on two occasions a gong sounds, meaning you have one minute to get back to the starting room otherwise you will lose a dice permanently. On top of this, if anyone is left in the temple after it collapses after ten minutes, then you all lose. Cooperation is vital. I enjoyed the game, and will look forward to playing again.When I'm not sure, as Nathan got scared by the game and bailed out leaving me to take his dice. We failed to beat this twice, but I think that it feels achievable. Next up was Forbidden Island, a game about which I have blogged previously. Suffice it to say that we were successful in winning the game, and Nathan was very happy with the outcome. Graham had got a copy of the game on the basis of my past review and enjoyed it, so it was useful having three experienced players. This was the third time I've played this at Novice level, so I think I'll be raising the difficulty next time to make it feel more challenging. Then we moved on to a game that takes the clever mechanic of shuffling the discard pile and putting it back on the top of the draw pile to another level. 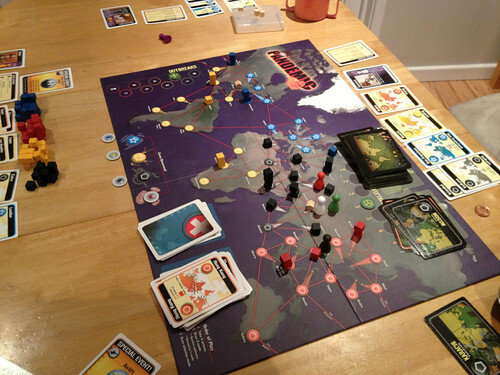 We played Pandemic, a game by the same author which I have reviewed before. This was my first outing with the game with other players, and – as I mentioned at the start of the piece – we failed. We found one cure and had two more about to be delivered when we ran out of the player cards, which is an instant loss. We spent far too long trying to nobble the disease rather than concentrating upon the cure. Of course, this is the sleight of hand the game throws you with all those disease blocks looking so tempting to fight. Unfortunately, we realised we had lost two turns before the end, which left quite an anti-climax. I'd like to try this one again though. 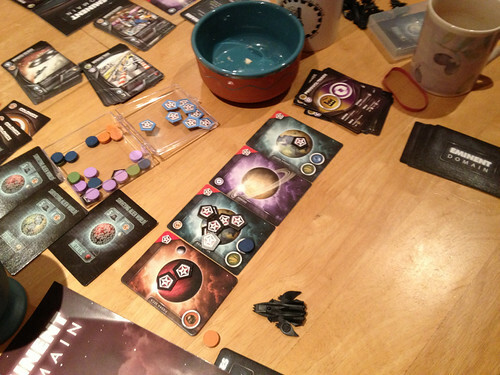 Our final game was Eminent Domain, which started life as a Kickstarter project, but I bought it from retail. This is a deck building game of interstellar conflict. What does that mean then? Essentially, this is a battle to gain influence points, which can be obtained by conquering or colonising planets, or through trade or other actions. We did find the game a struggle at the start, but this was partly due to Nathan's fascination with the model spaceships, coupled with his insistence that Andy was called Dave! The game revolved around a deck of role cards, which include areas such as warfare, survey, colonisation, production or trade, and research. Each player starts with an identical hand of cards, which is tailored either consciously or unconsciously to the strategy that they have adopted through card draws and deliberate permanent discards from the hand. Players also start with a world located on survey, which needs to be colonised or conquered. Eminent Domain game turns have a simple structure. You have a hand of cards, which is limited to five at the end of your turn, which comprises role cards and later technology cards. Initially, half your deck is in play so you know what can be gained from drawing from the remaining cards. As you tailor the deck, this becomes more and more effective. At the end of the turn you can discard any or all of your cards and draw back to the maximum hand size (which can be increased by acquiring certain planets). The first phase of your game is optional - you can play a role card or a technology card as an action. This usually is more limited than playing it in the role phase of the game, but can also be very useful. Cards usually have two descriptions on effects dependent on phase. For example, a survey card will allow you to bring two cards out of your unused pile (exceeding deck limits if necessary) when played as an action, or permits you to look and choose a planet card for a settlement target in the role phase. You can use this first phase to prepare for the second. The second, role, phase means you select a role card type and draw it into your hand from the central deck pile. You can then play it, backed up with other cards, to gain an effect. For example, if a planet requires four colonisation counters to settle, you could pick colonisation, add a further four colonisation cards from your hand, and land colonies and settle to capture a planet. As 'leader' in the role phase, you get advantages over the other players. Once you have acted, the other players each get a chance to either follow the action you have played by using the same role card(s) without the leader's bonus, or to dissent and pick a card from their unused pile to add to their hand. Thus, it is possible to have a hand bigger than the deck hand limit right up to the end of your turn. Once all other players have decided whether to follow or dissent, you then get to clean up your deck, discarding and drawing ready for the future. 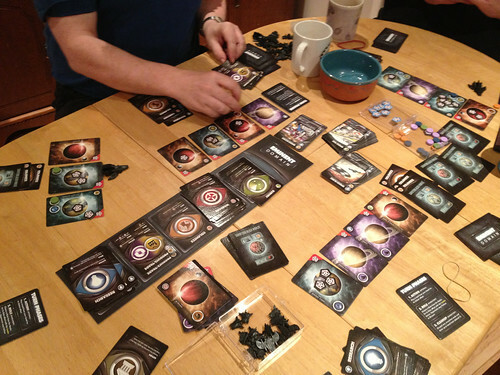 The turn moves clockwise around the table, with the Action/Role/Clean-up cycle starting for a new player. Using the research action can gain you extra advantages with technology cards in your hand that give special effects for the action phase, or reduced costs for certain role actions by acting as role cards. Some technology cards cycle through your hand in the same way as role cards, whereas some have permanent effects. Planets also give an advantage when colonised or conquered as some can produce resources (which can be converted to Influence Points by a produce/trade card), some have the same effect as a role card (for example acting as if an additional production card was played), and they also have a basic value in influence just from ownership. The game is actually quite simple, but the follow/dissent mechanic was new to us, which caused some confusion. It was no surprise that Simon – who grasped the mechanics first – went to win through a huge production and trade programme. You can't directly attack another player, but you can hamper them through your choice of roles. For example, had we realised how close Simon was to winning earlier then we could have deliberately avoided choosing the role that benefited him most – Production/Trade – thus starving him of opportunities to extend his hegemony. There are a huge number of options and approaches to the game, and I'd love to try it again to see where it goes to. I think that was the feeling around the table, with a replay of this being the most popular to return to in the future. Thanks to all present for a great afternoon, and to Jill for her patience! 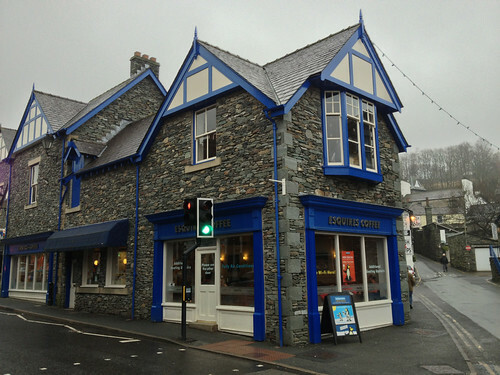 I'm writing this in Esquires coffee shop in Ambleside in the Lake District. Jill and I have been away on a child-free weekend (with my parents looking after the little tykes), staying at very nice hotel with a spa to celebrate our tenth wedding anniversary. It's been a while since we last got time together like this, and every time we do I end up thinking that we must do this more often. I guess the living 100 miles away from family takes its toll here. Anyway, perhaps I should make a resolution to try and do this every few months, as its great to be away as a couple. 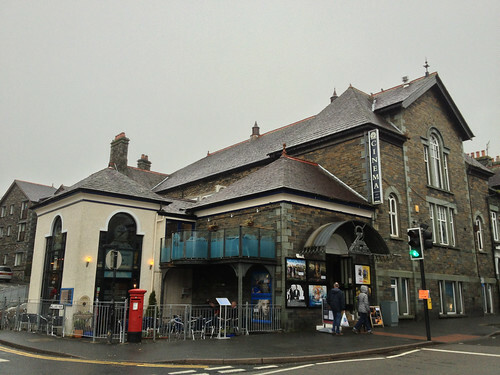 Jill is at the hotel, pampering herself with a 'treatment', whilst I've been wandering through Ambleside, browsing at shops and generally chilling out. 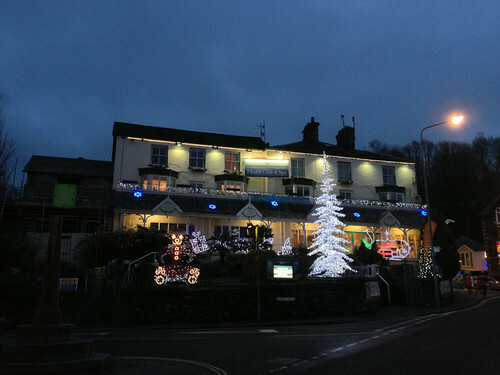 The hotel has been excellent (Best Western Ambleside Salutation), living up the recommendation from the Wetherby Methodist Church 'Bootbashers' society. Rooms were good, with a decent swimming pool, hot tubs and steam room.We didn't sample the food beyond breakfast, mainly as we had other places we wanted to be. 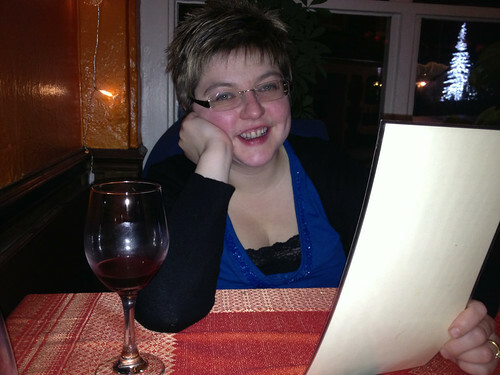 Friday night saw a lovely Italian meal at Zeffirelli's Jazz Bar, following by a showing of The Hobbit. That was great too, but we left with a headache from the 3D. I'm tempted to arrange another showing to see it in 2D, as I think that the film will look better. Although the shots were lovely, I can't help but think that some of them suffered from being 3D, as they moved too fast to allow the eye to linger and appreciate the spectacle. As a big Tolkien fan, I was more than happy with the way that the film had been treated, but I do wonder how they will manage to stretch it to another two films. Saturday started lazily, with a breakfast nearly as late as we could achieve, and then we went for a wander around town. 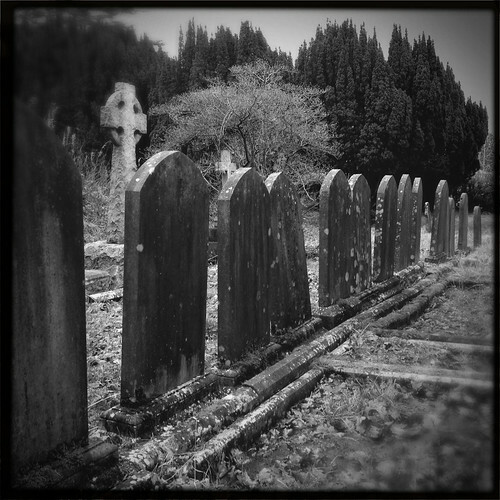 Bizarrely, we spent a good chunk of time wandering around the parish church grounds and graveyard. Like a muppet, I had forgotten to bring my camera, so I was using my iPhone. The light was just right for black and white, with not enough contrast for colour so I used the Hipstamatic app (my favourite iPhone camera app); I'm pretty pleased with the results, but I was reminded how power demanding the post-processing is, with nearly half my battery going. 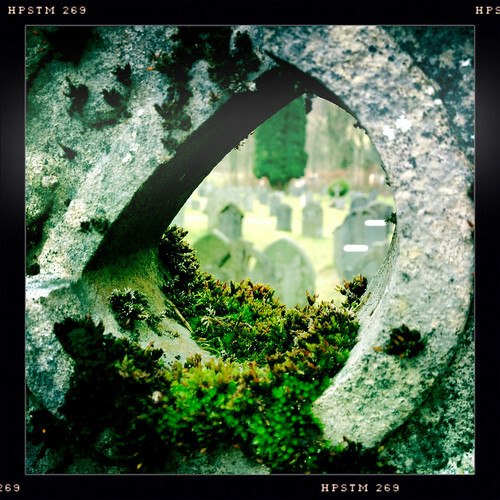 It's funny how looking at all the grave inscriptions makes you feel more in touch with what has happened in a community. I guess it's the little things that it draws out, the human day-to-day triumphs and falls. We chilled out at the spa when we got back to the hotel, and celebrated back out our room with a very nice bottle of Champagne that my parents had given us. Then we headed out to Doi Imtanon (which sounds like a place in Middle Earth) Thai restaurant for dinner. 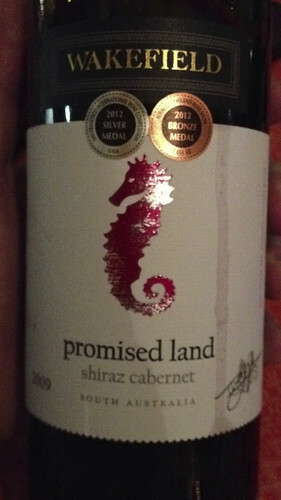 The service was great, and I must confess that we probably over indulged in wine because we found a nice bottle of Shiraz-Cabernet from the same Vineyard (Wakefield, South Australia) that had supplied the wine for our wedding breakfast. Same vineyard and very close to the wine from our Wedding breakfast, glug. Fortunately, I was much less delicate this morning than I expected, so am feeling quite chilled out. We were going to try and watch 'the life of Pi' this afternoon, but have decided against it so we aren't back too late, as reality intrudes again tomorrow with a return to work and school. It's been lovely getting time with Jill without other pressures, and I'm fortunate to have such a wonderful wife.